We are currently updating our site to enable our customers to be able to view and order our full range of enclosures, accessories and supplements. Please bear with us whilst we add these exciting new features. In the meantime, please feel free to contact us directly or visit our Facebook page for more information. At Chameleonworld Muji we are pleased to have the opportunity to offer you Pro-Flo our quality long lasting enclosures, for the serious hobbyist and breeder. Our lightweight enclosures are handmade using specially extruded aluminium frames, which won’t rust or age. The black aluminium mesh we use is imported for its high quality and resilience. Pro-Flo can be used outside all year round and will not be affected by the elements. They come with a flat abs base which is screwed onto the enclosure and can also be used with our drainage bases. We feel there is no other product available in the UK which will match our quality and personal touch. 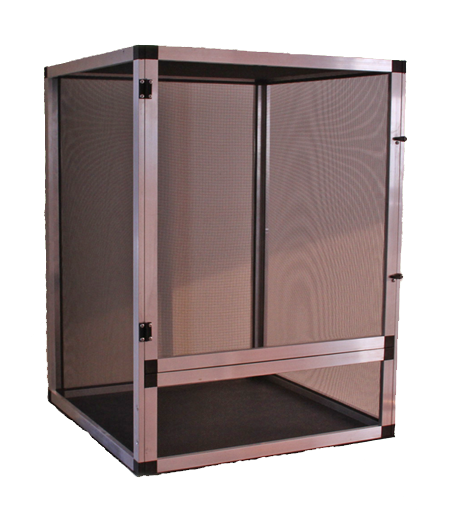 We can also make custom sized vivariums to suit your individual needs, which will be priced individually. Please, enquire for a quote. Please, click on the panel below to reveal our price list. Along with our new Pro-Flo enclosures, we are proud to announce the launch of our Hydro-Flo range. This is a unique drainage system which we have used for many years. As we all know hydration is paramount in our chameleons husbandry and we’ve really felt the benefit of heavily misting our enclosures without the worry of flooding. Our Hydro-Flo bases have been made using three specially made dies which we’ve designed with the help of a tool maker. A proto type had to be made to make sure we’d got the dimensions right. We were then sent samples so as we could test them, making sure they worked. After making several design changes and tweaking the dimensions, we’ve finely got there! Bases can also be sold separately. * Please note custom made vivariums may not be suitable for our Hydro-Flo range. See prices below. Along side our Pro-Flo and Hydro-Flo ranges, we are now offering our handmade enclosures with solid back and sides, which you can choose from either green or black. We can also make custom made doors, panels, misting wedges and stands, please enquire via email and we will send you a quote. We are a UK distributor for Sticky Tongue Farms Miner All and Vit All . Visit our Facebook page for more details on our supplement bundles. Preferred payment methods are bank transfer or Paypal, please ask for details.